Commission Paula Novak to create a one-off fantasy painting picturing you or your children alongside Aslan, the hero of the Narnia chronicles. 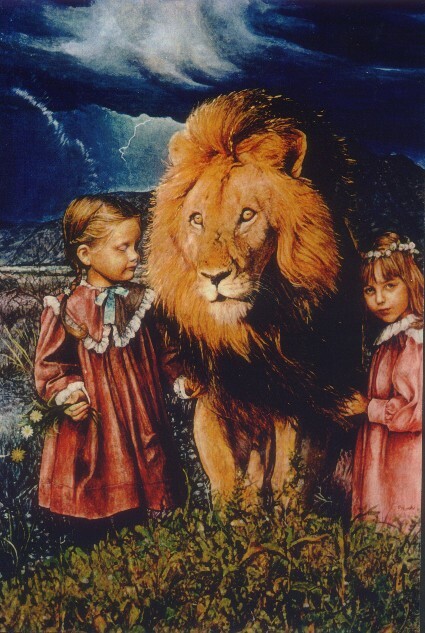 At left is Paula's depiction of story characters Lucy and Susan with Aslan. But Peter and Edmond were also characters in this wonderful tale that has enchanted children for decades and is now a major motion picture series initially filmed in New Zealand during 2004-2005. Describe which part of the Narnia story most appeals to you, scan photos of the people you wish to include in the painting with Aslan (up to four) and attach them to your email to Paula. She will send you a sketch to approve before starting on the final masterpiece. Be in quick to secure this lifetime memory. Requirements: Several good quality colour photographs of the individuals to be included in the painting with Aslan. Payment: Through PayPal, by direct bank deposit, cheque on a major bank or money order. Postage and packing extra. The Lion, the Witch & the Wardrobe, Narnia and the Chronicles of Narnia are trademarks of Harper Collins, C.S. Company Lewis Ltd., Walden Media, and Disney. Works inspired by these works of fiction are not considered derivative and thereby not intended to be an infringement of any Copyrights or Trademarks.